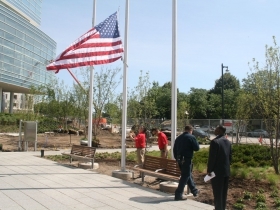 New tower, new flagpoles and a ceremony honoring veterans. 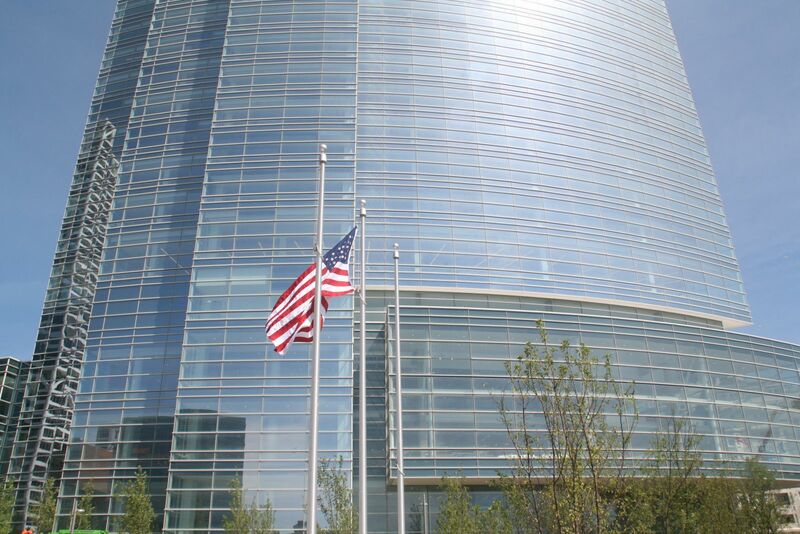 Newly raised American flag at Northwestern Mutual Tower and Commons. Photo by Jeramey Jannene. 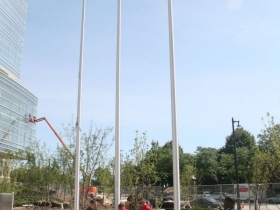 Having recently taken ownership of their new 32-story office tower, Northwestern Mutual decided to put the flag poles to use for the first time on Monday. 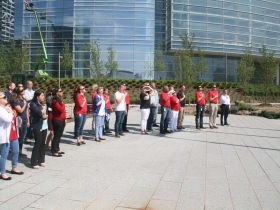 Honoring the dozens of veterans that work for the insurance company, a team of NM employees raised the United States flag for the first time in the large garden that wraps the building along E. Wisconsin Ave. 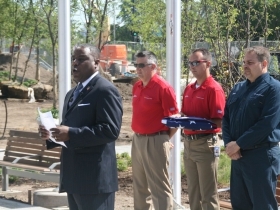 The brief ceremony was emceed by Ron Adams, a captain in the Wisconsin Army National Guard and a member of the insurance company’s diversity team. Following opening remarks by Adams, those gathered for the event sang the national anthem and recited the pledge of allegiance. 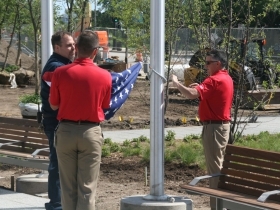 In an interview after the ceremony the firm’s Military Veterans Employee Resource Group chair Greg Fischer stated “today is really a historic day as we open the tower and commons and celebrate America.” Fischer is a veteran of the United States Marine Corps. 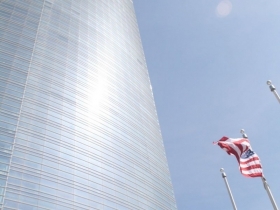 Northwestern Mutual is scheduled to move into the new $450 million complex on August 21st. A partnership of Gilbane Building Co. and C.G. Schmidt Inc. broke ground on the complex on August 26th, 2014. For more on the building, see our June 23rd article. My only complaint is the cross walk that resides closest to the Betty Brinn Children’s Museum ( leads from the Northside of Wisconsin to O’Donnel Park). Vehicles that go west bound on Wisconsin can not visible see the pedestrians until their on top of them.